A roundworm infestation is common in young puppies or stray dogs. Typically young dogs develop immunity to the parasite early on in life. Roundworms impact your pooch’s digestive tract, making him sick and malnourished. This parasite spreads easily through eggs in stool droppings. Those eggs do die, but it doesn’t happen quickly. Once eggs pass through feces, the roundworm still has to develop inside the egg for about a month. These eggs are “alive” in a sense, but not active yet. Once the roundworm is developed and ready for a host, the eggs become “infective.” This means that if your pet ingests the eggs, the roundworm is highly likely to nest in his gut. 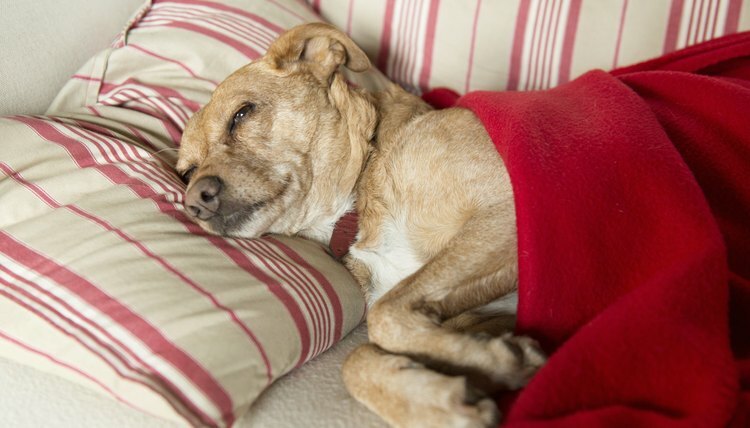 Since roundworms can live in your barking pal for years, they eventually can burrow their way into his airway, causing a pneumonia or other complication. Of course, you can do your best to clean up stools and minimize your dog’s exposure to roundworm eggs. However, you won’t be able to kill all eggs in his environment. Even harsh chemicals are unlikely to destroy roundworm eggs. Eggs can survive in soil in severe climates -- cold or heat -- for several months. The only thing known to kill them is extreme heat, such as from steam or fire. Because the risk of roundworm infestation is always there, talk with your vet about preventive measures and keep your dog from digging and eating dirt.